For many in international affairs, borders are material facts, dividing the world into what John Ruggie calls “fixed, disjoint and mutually exclusive territorial formations.” On this view, borders may be “contentious and controversial in their location” (as John Williams argues in his 2006 book The Ethics of Territorial Borders) but not in the function they perform. This approach went more or less unquestioned until relatively recently, when geographers began to rethink the analytical value of the territorial border. The academic field of critical topography stresses how the ‘winds of change’ blowing through the global North since the 1970s (denationalization, privatization, Europeanization) are creating a territorially ‘borderless world.’ Today, borders are also becoming increasingly virtual due to the fact that we deal as much with ‘spaces of place’ as with ‘spaces of flows’. Political authority has, as a consequence, relocated – not only upwards and downwards but sideways, to private actors. This has spurred some controversial claims: It has led to hyperglobalist scholars propagating the “end of the nation state” and state transformationalists insisting on its ‘structural transformation.’ Critical topography in turn does its part by arguing that to truly understand international affairs, the concept of ‘the border’ needs to be epistemologically reconceived, from being understood as a material feature to a social one. We need to move away from understanding borders as lines in the sand, or outcomes of environmental conditions and political events. In his political ecology analysis of North American border space, David Rossiter frames the issue from the unusual perspective of a lemon, purchased in the US but prevented from crossing the border into Canada. Rossiter postulates that “the fruit represents a socio-material artifact that embodies multiple threats to US national space” post-9/11. The concern here is that we’re witnessing a transformation of territorial borders to which the academic community needs to react. As mentioned above, borders are undeniably taking on new dimensions, at least in the West. But in other parts of the world, borders are still predominantly about lines in the sand, about inclusion and exclusion, buttressed by discrete cultural, economic and political arrangements. This is especially true in the post-colonial world, but it is also more true in the West than much of the literature allows. In Europe, the territorial border is the epistemological ground for the current wave of right-wing extremism. Palestine’s plea for UN recognition this week reminds us of a territorial dispute that has defined politics in the Middle East – indeed the world – for half a century. Notwithstanding unprecedented levels of regional integration in East Asia, Kashmir, Tibet, Sri Lanka, Taiwan and Timor Leste continue to be hornets’ nests in their respective regions. And, if we are to believe STRATFOR, it will not be long before the battle for Antarctica sets that icy continent ablaze. Academic inquiry is often criticized as being out of touch with the ‘real’ world: It either lags too far behind the latest developments, or is guilty of trying to sing an imaginary world into existence. Between the two, critical topography tends slightly to the latter, overplaying the shift from a politics of territorial borders to a non-territorial one. While it accurately depicts a trend (in certain parts of the world) towards borders that are more and more virtual, a decisive shift in the understanding of borders from territorial realities to social constructs is unlikely to happen overnight. Because they are academically and psychologically part of our current world imaginary, territorial borders will remain a point of departure. Things are gradually changing however, with territorial borders being trivialized in the West not because they’re disappearing – but because they are slowly being forgotten. 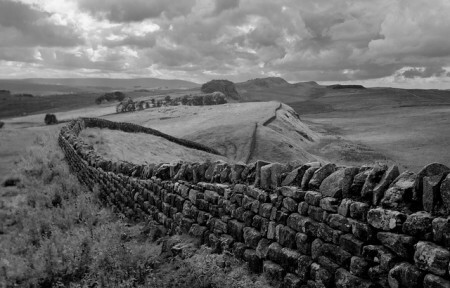 As Hadrian’s wall crumbles stone by stone, so — little by little — does what it once (literally) stood for. Recently, the Correlates of War (COW), a database on military conflict, reoriented its focus from developing datasets on inter-state wars, which are decreasing, to mapping intra-state wars. Most of these, they argue, take on the same inter-state war dimensions of territory disputes. Sites of ongoing intra-state territorial disputes include, as the map illustrates: Guinea, Nepal, Liberia, Cote d’Ivoire, Phillipines, Sudan, Indonesia, Yemen, Chad, Somalia, Ethiopia, Sri Lanka, Russia, Tibet, the Balkans and Northern Ireland.